After a multi day (week?) saga of trying to get op25 to run on a Raspberry Pi, I decided to give it a try on a linux virtual machine, and had much better results. For the radio hardware I used one of the ubiquitous RTL SDR Dongles. I’m using VirtualBox for the VM setup. I did it on macOS, it should work the same way under Windows. Create a new linux VM. I gave it 8G of RAM (perhaps overkill) and a 30G volume. Go to Settings -> Storage for the new VM, select the ISO as the optical disc image. Boot the VM, and install. I won’t go into the installation details, in general I found the defaults worked fine. I installed the Guest Additions so I could cut and paste between the OS and VM. I ran gqrx, and verified the dongle was working. Next you need to go to https://www.radioreference.com/ and locate the details on the trunking system for your area. Several control frequencies may be listed for your system, you need to find the currently active one. In my case, I checked them all until I found one frequency that was continuously transmitting, 852.9375 MHz. Now, the next part was perhaps the most difficult, you need to determine the correct ppm error for your RTL dongle. All dongles seem to be off, some more than others. Mine turned out to be off by a LOT. The other tutorials I read gave examples with ppm errors of around 2 or 3. I spent a lot of time trying small values like that, and even up to 20 or 30, without success. I brought up the spectrum plot in op25 (hit the 1 key) and looked at the spikes, representing transmissions, and checked them against my R-7000 receiver. It was confusing at first, trying to match things up. 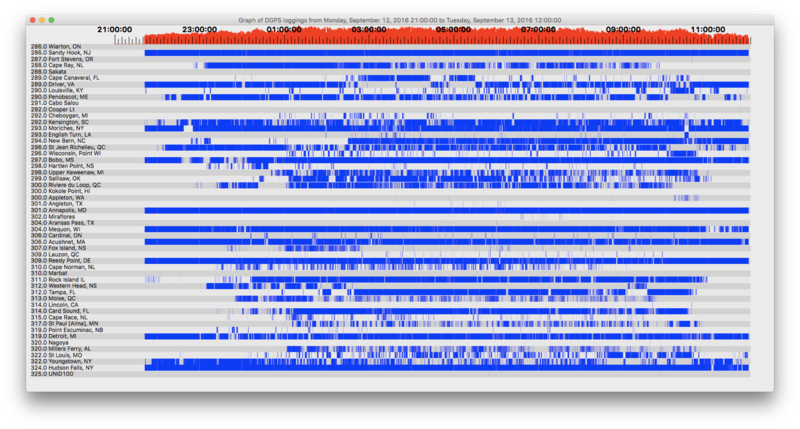 I eventually realized my dongle was off by a huge factor – about 150 kHz at 853 MHz. I ended up using a ppm value of 173, and that seems to be working. Your value will likely be different, but carefully use the spectrum plot to determine what it is, or at least get close. Then you can iterate up and down by 1 ppm. Another recommendation I read, and used, was to set the offset (used to avoid the 0 Hz spike) to zero for initial testing. help center the control frequency. Once that worked, the next step was to find the NAC value, which is displayed in the op25 program, in my case it was 0x661. 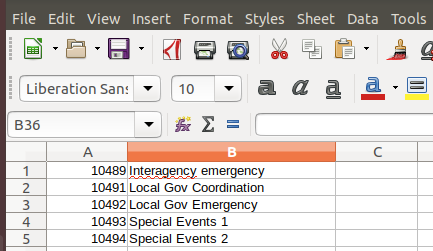 In the apps directory, open the trunk.tsv file in the LibreOffice editor built into Ubuntu, it opens as a spreadsheet. I edited it as follows, entering in a system name, setting the control channel and NAC values. I left the modulation alone (CQPSK) and entered a new tags file name, we’ll create that file next. 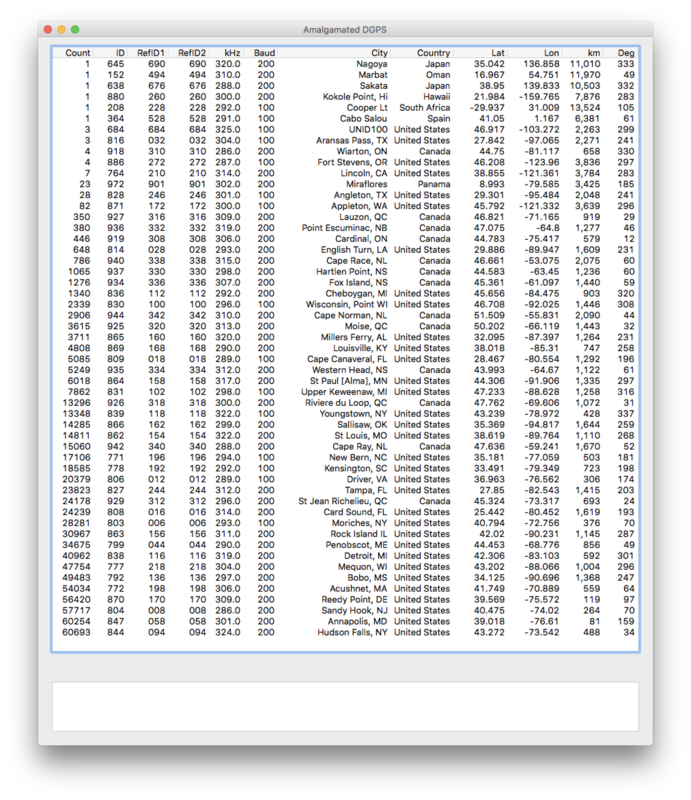 I then duplicated the tompkins.tsv file, renamed the duplicate carroll.csv to match what I entered in trunk.tsv, and then opened it in LibreOffice. I am using an offset of 25 kHz (25000 Hz), and notice I now had to change the ppm to -181, the RTL dongle drifted that much in a few hours! As you can see, the AirSpy is much more accurate, the ppm value is only 3. I decided to install Ububtu on an older i3 laptop. I resized the Windows 10 drive, and freed up 200GB (perhaps excessive, but the drive is 750GB, and I don’t really use the laptop much anymore for Windows) for the linux partition. I followed the above steps and got gqrx running first, then op25. I have not tried with the AirSpy yet, but even with the RTL dongle, things are improved, the audio quality and overall reception are noticeably better. Here’s my comparison of the new AirSpyHF+ plus vs the RF Space netSDR. 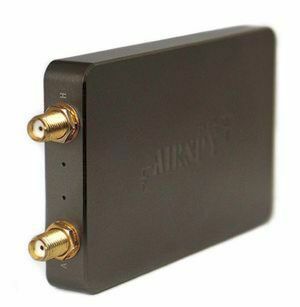 The netSDR is one of the higher end SDRs, often considered the “gold standard”. So how does the AirSpyHF+ match up? The AirSpyHF+ has two Sigma Delta ADCs with a 36 MSPS rate, an 18 bit DDC (Digital Down Converter) and (near as I can tell) always produces a 768 kHz I/Q stream. The frequency range is 9 kHz to 31 MHz, then 60 to 260 MHz. The selling price is about $199. The netSDR has a 16 bit A/D, sampling at 80 MHz. The frequency range is 10 kHz to 32 MHz, which can be extended to over 1 GHz with the Downconverter option. I/Q stream rates are up to 2000 kHz. The list price was $1449. I fed both receivers with the same antenna, my Crossed Parallel Loop, through a splitter. The AirSpyHF+ always samples at a 768 kHz rate, I set the netSDR to a 625 kHz rate, the closest. SdrDx software was used in both cases to make the I/Q recordings. In the case of the AirSpyHF+ I used my own server app to feed the I/Q data to SdrDx. I then recorded the 25 and 19 meter bands, and selected several transmissions to compare. In both cases, mySdrPlayback (an app I wrote) was used to playback the I/Q recordings and convert to WAVE audio, which was then converted to mp3 at a 64 kbit rate. I tried to start each record at about the same time and used the same IF filter width, for fairness. I also made one set of recordings of a relatively low power pirate radio station that plays Christmas music. I think it’s pushing the Part 15 limits, but still is not very powerful, and is probably about ten miles away. Many of these recordings are of weak signals. There’s no doubt that most any modern SDR is going to do well with strong stations. A more important question is, how to do they work with weaker signals? So how do you think each receiver performed? Let me know in the comments. 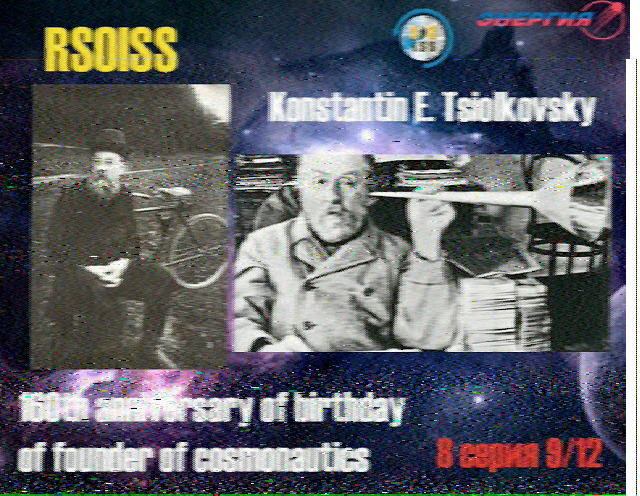 The International Space Station is sending SSTV (Slow Scan TV) images on 145.8 MHz today through Friday. Here are two images I just copied from the 1938 UTC (2:48 PM EST) pass. They were transmitted in PD120 mode, and copied using MultiMode Cocoa software (which I happened to write), on a netSDR receiver connected to a discone antenna (which is many years old, and missing several elements). 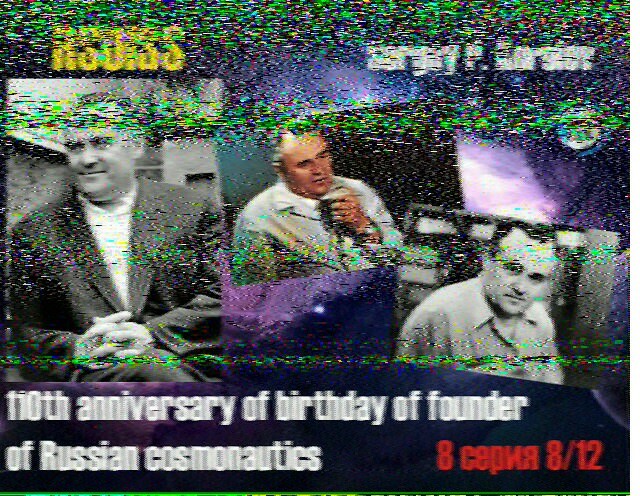 SSTV is a method of transmitting a picture using audio tones. It takes about two minutes to send an image. Hence the Slow part of Slow Scan TV. 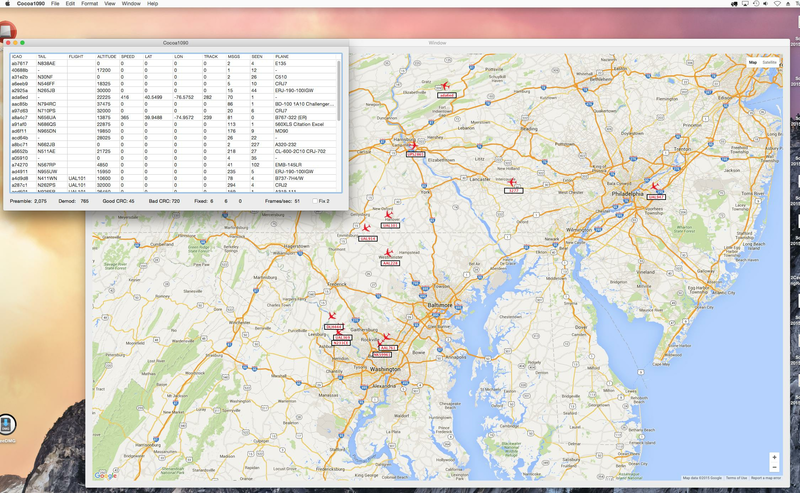 Recently, I have been DXing DGPS (Differential GPS) stations on the longwave band. They occupy the region from 285 to 325 kHz. I’ve been getting some pretty good results with some custom software I wrote that demodulates all of the DGPS channels (1 kHz apart) in parallel from I/Q recording files from my SDR. This lets me analyze the entire band from a set of overnight recordings. That itself is the subject of another post I am working on. I decided to build a low pass filter that just passes the longwave band, attenuating medium wave and shortwave, in an attempt to improve reception of weak DGPS signals. The filter is flat to about 400 kHz, then starts attenuating. It is down about 30 dB at the start of the MW band (530 kHz) and reaches about 45 dB by 700 kHz, then eventually reaches about 50 dB. My strongest local MW stations are on 1280 and 1320 kHz, so I felt this was sufficient. I did not want to attenuate signals on the longwave band itself. I previously wrote about Building an RF Noise Generator For Testing Filters and included some plots showing the noise spectrum taken with an AFE822x SDR running the SdrDx software. Below is a plot of the noise generator fed directly into the SDR over the range of 100 to 1700 kHz. Next, with the filter installed. Most of MW is knocked out, except for a few locals and stations on the lower end of the band. 580 is WHP in Harrisburg PA with 50 kW. A few more stages on the filter might be able to attenuate that some more, but I’m pretty happy with things already. DGPS stations transmit the difference between positions indicated by GPS satellite systems and the known fixed position of the station. This allows higher accuracy. DGPS transmissions are 100 or 200 baud and are transmitted on frequencies from 285 kHz to 325 kHz in the longwave band. Hundreds of these stations are operated by the Coast Guard and other agencies around the world, and they can be interesting DX targets. Each station transmits a continuous stream of messages containing correction data for GPS. These messages also contain the station ID code, so they can be used to directly ID the station. The usual way to DX these stations is to tune your receiver to a particular frequency, run your DGPS software (which I have for Android , iPad/iPhone and Mac OS X) set for one baud rate, and wait to see what station(s) are heard on that frequency. Then change baud rates, tune to the next frequency, and try again. Since SDRs are capable of recording a chunk of the RF spectrum directly to a disk file, I realized that a decoder could be written to demodulate all of the DGPS channels at the same time, at both baud rates. They write this data as a I/Q file, storing the complex representation of a portion of the RF spectrum. A 50 kHz bandwidth is slightly more than enough to cover the entire DGPS band. I set my SDR software up to record overnight, then in the morning I can run the recordings through the software, and see what stations are present. The software sets up 82 SSB demodulators, two for each of the DGPS channels, one is for decoding 100 baud and the other for 200 baud, that allows me to use a more narrow filter for the 100 baud case. 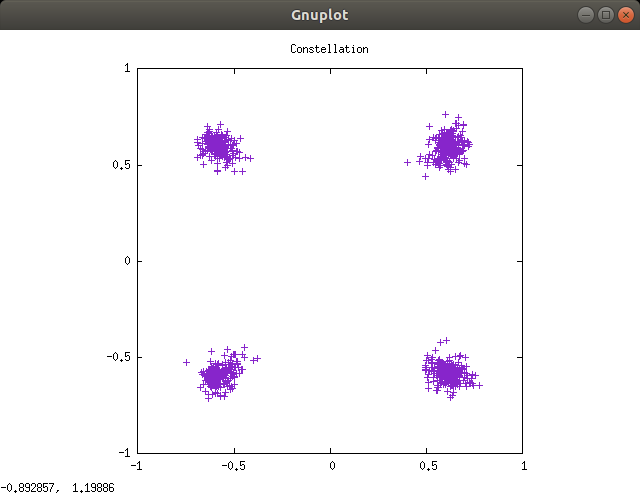 The output of each demodulator goes to a DGPS decoder that looks for valid messages. A message is considered valid if it starts with the correct preamble byte, is of message type 6 or 9 (the most common sent), has a z-count (which is a time code offset from the hour) that is within a few seconds of what it should be, and passes the 6 bit parity word test. This eliminates the vast majority of bad message decodes, although every so often one will sneak through. This is because you can get multiple bit errors on a message that corrupt both the data and parity word in such a way that the parity check still passes. It is still necessary to visually inspect the decodes, and decide if a seemingly amazing DX catch is realistic, or more likely just a bad decode. 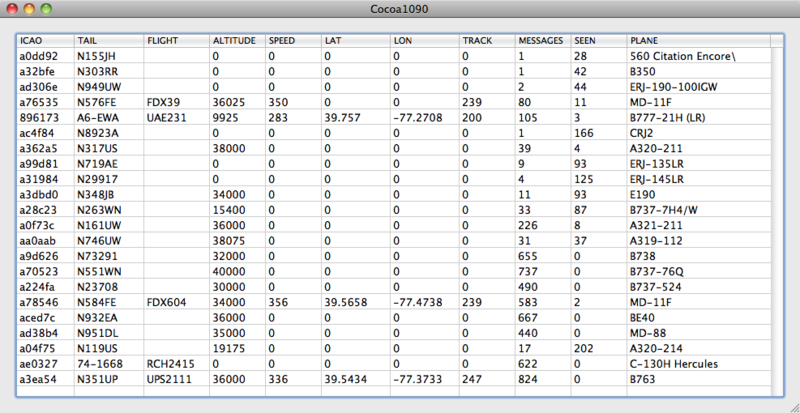 Below is a screenshot showing the output of approximately 24 hours of recordings of the DGPS band. •	Count: the number of decodes of this station. •	ID: ID number of the station, stations transmit either the ID or one of the reference IDs. •	RefID1: The first reference ID of the station. •	RefID2: The second reference ID of the station. •	Baud: The baud rate, 100 or 200. •	km: The distance to the station from your location. •	deg: The bearing to the station from your location. Most likely the Wiarton and Angleton decodes are corrupted messages, as the frequencies they use are both dominated by strong semi local signals. You can see the various times stations were decoded. There are cases where a single decode was received (just a thin line), which was possibly a garbled message. But there are also cases for DX stations where several messages in a row were received (a thicker line). It is quite improbable that many messages were garbled in a row, with exactly the necessary bit errors to change the ID of the station, but also preserve the parity word check. It is interesting to observe how two stations on a given frequency will alternate reception, as one fades out and the other fades in. A very preliminary beta version of this program, Amalgamated DGPS, is available for download for those who wish to try it. It is only for Mac OS X, and requires I/Q recording files made in either the RF Space or Perseus format (and note that I have only tested with the former, the latter should work, but you never know). While there is no Windows version available at present, I may have one available shortly, so stay tuned! It’s often handy to have an RF noise generator when testing various circuits, especially filters. I was working on a low pass filter for long wave, and wanted a way to measure the performance of the filter. A zener diode as the noise source. Zener diodes, when conducting a very low current, produce a wide spectrum of noise. In this case I used a 6.8 volt zener diode, similar values should work as well. A single NPN transistor used to amplify the noise form the zener diode. A variable resistor to adjust the current through the zener diode for maximum noise. Three resistors, four capacitors, and an inductor (to filter out noise you don’t want, from the power supply). In my case, I powered the generator from a 12 volt DC power supply, you could use a 9 volt battery as well, if you wish. The incoming DC power is filtered by the inductor and two capacitors. Next it goes through the variable resistor as well as a fixed 10K resistor, so that the maximum current through the zener diode is limited to a safe value during adjustment. The noisy zener diode current is then applied to the base of the transistor, used as a common emitter amplifier. I used a 2N3904, other values should work as well, though you may need to adjust resistor component values. The 0.1 uF capacitor keeps the voltage on the zener diode relative constant. The 680 and 1000 ohm resistors in parallel are values I had in my parts bin, suitable to use in parallel based on the current to the base of the transistor. The transistor output is the AC coupled through another 0.1 uF capacitor. OK, back to the noise generator. 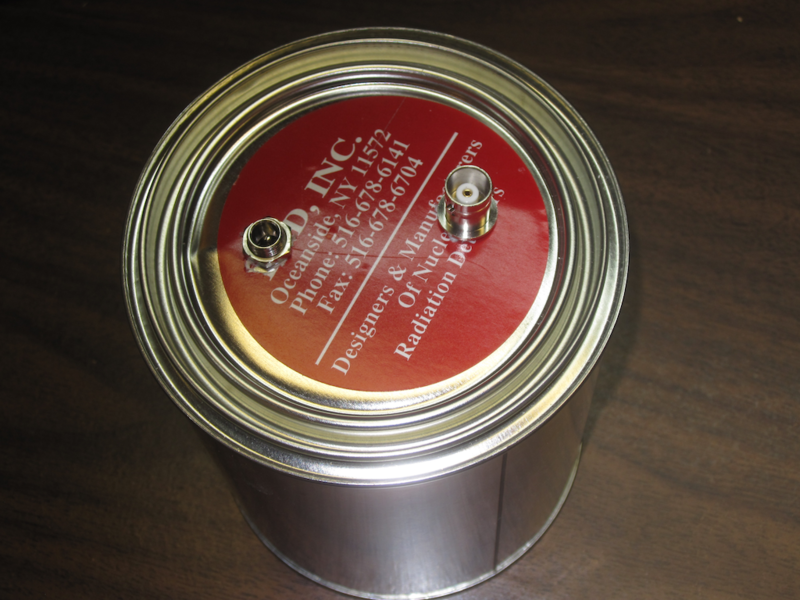 The paint can lids are handy for prototyping RF circuits. 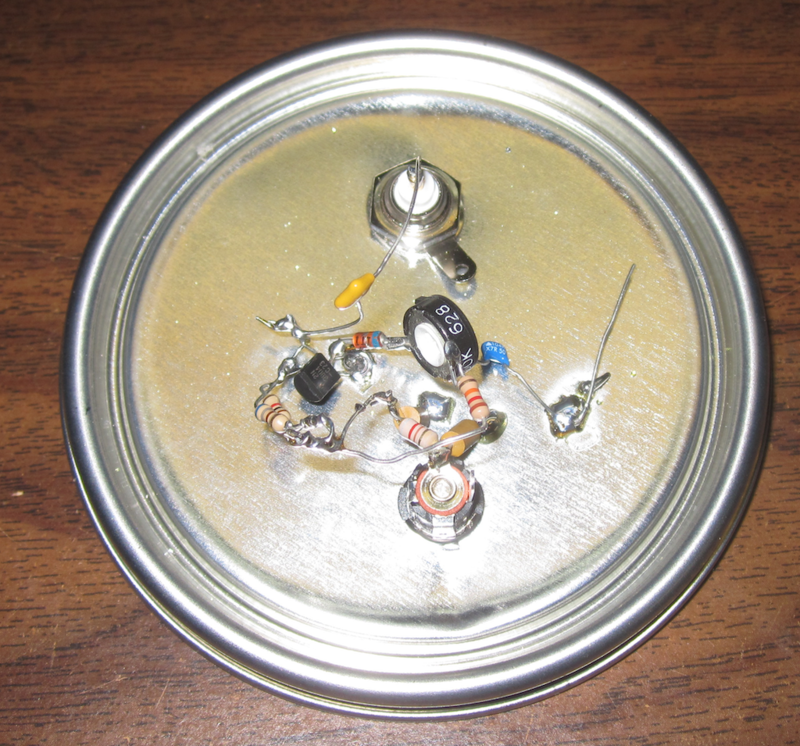 You can built them dead bug style on the bottom side of the lid, test them out, then put them on the can for your RF shield, as shown below. The two connectors are a BNC jack for the RF output, as well as a standard DC power jack for the power supply. For looking at the generated noise spectrum, I used the fabulous SdrDx SDR software by Ben, AA7AS, along with an AFE822x SDR. The increase in noise level is about 50 dB, very suitable for testing filters and such. I’ve had a few of the RTL radio tuner dongles for a while. These are USB devices that were originally made for use as TV tuners overseas, but it turns out that you can access the I/Q data stream, and turn them into an SDR (Software Defined Radio). They can be tuned roughly over a range of 25 to 1700 MHz, and sometimes even higher, depending on the tuner IC chip inside the particular dongle. 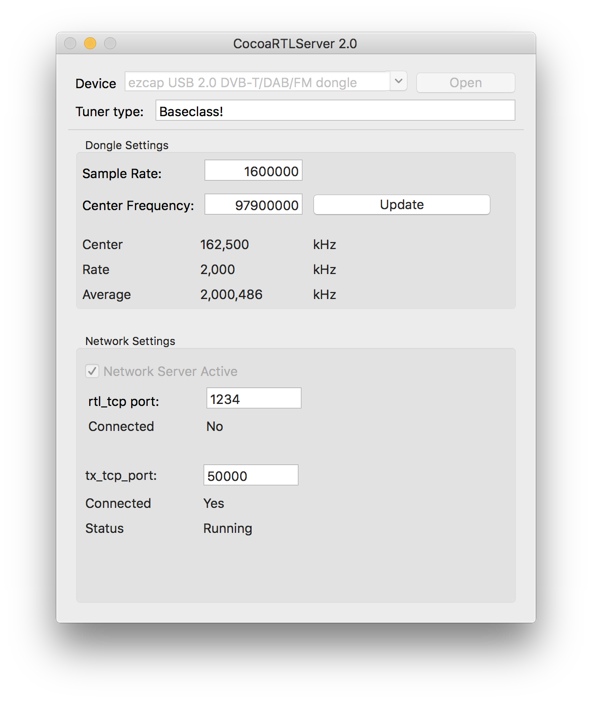 I previously posted about how to get the RTL dongle working on the Mac here: An SDR for $17 – The R820T USB RTL-SDR DVB-T Dongle and here: An SDR for $17 – The R820T USB RTL-SDR DVB-T Dongle – Part 2. These posts were from 2013, and I did the installation on a Mac running OS X 10.6, using some pre-built libraries. Fast forward to the present day. 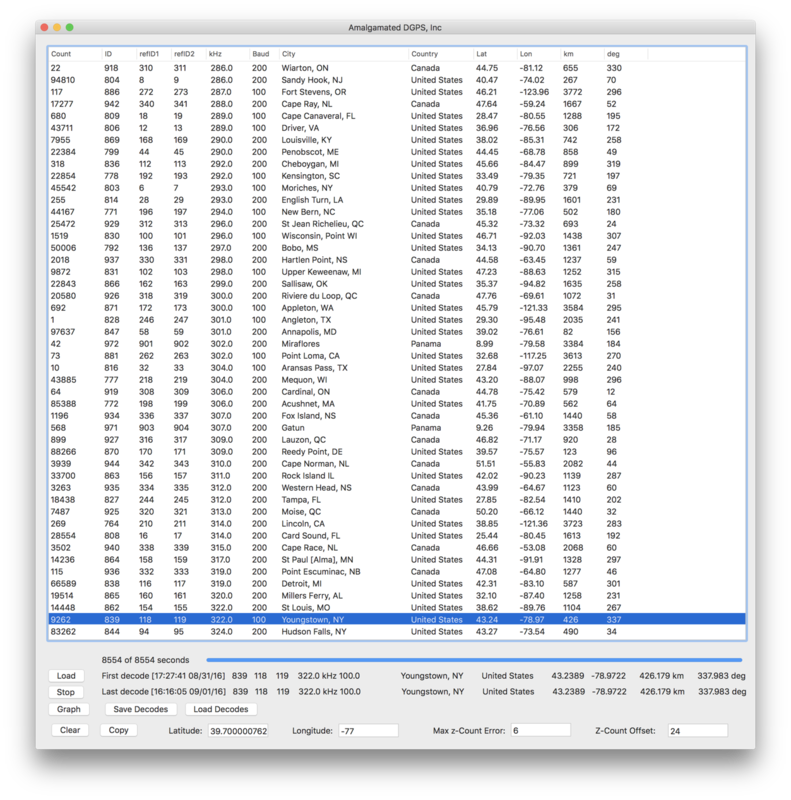 I got a new Mac running OS X 10.11 El Capitan, and I wanted to be able to use the RTL dongles with my favorite SDR software on the Mac, SdrDx. Enter Cocoa RTL Server. Cocoa RTL Server is a stand alone app that interfaces with an RTL dongle. It does not require you to build or install any drivers or libraries. It just works. It’s based off of an open source app called SoftShell, that I heavily extended. 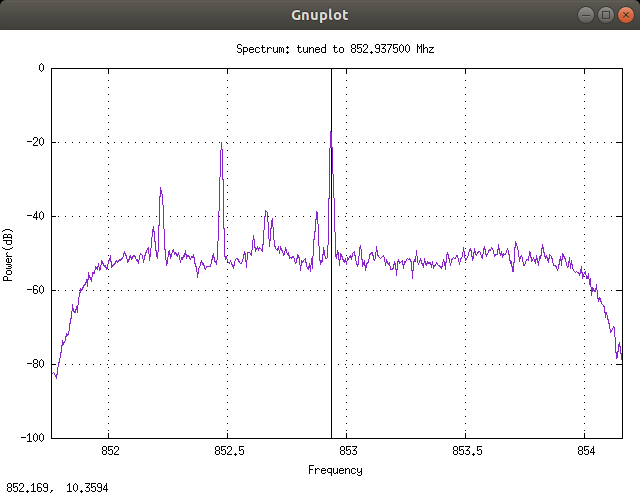 Cocoa RTL Server also acts like a networked SDR, following the RF Space protocol. 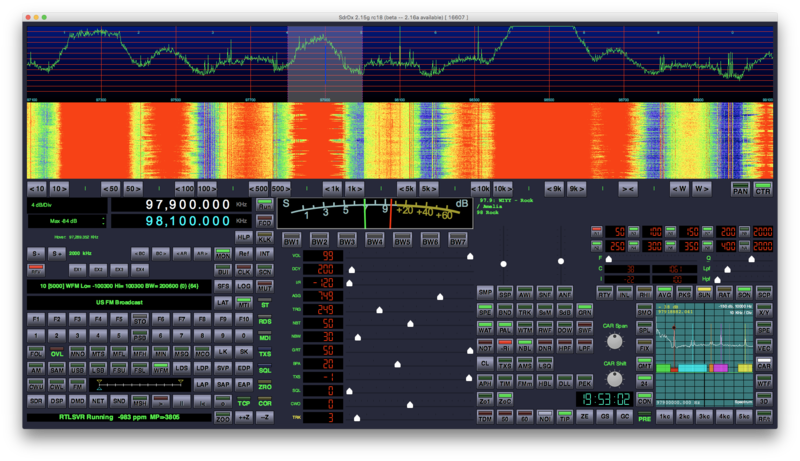 That means it works with SdrDx, as well as any other SDR app on the Mac that supports RF Space SDRs like the netSDR. You can download a copy of the app from the Cocoa RTL Server page. Source code is included, however I am not offering any support for the project or final app. I’ve run it under Mac OS X 10.6, 10.10 and 10.11, It should run under 10.7-10.9 as well. It only works with RTL devices with an E4000 or R820T tuner IC. In this case I am tuned to 97.9 MHz. To the left of the signal meter, you can see it has decoded the station ID from the RDS data. Yes, SdrDx decodes RDS. You can see the main audio above the green marker to the left. The stereo pilot at 19 kHz (red marker). If you use an SDR-14 or SDR-IQ with Mac OS X 10.10 or 10.11, you may run into issues due to Apple’s built in FTDI USB driver, which prevents the FTDI D2XX library from accessing it. 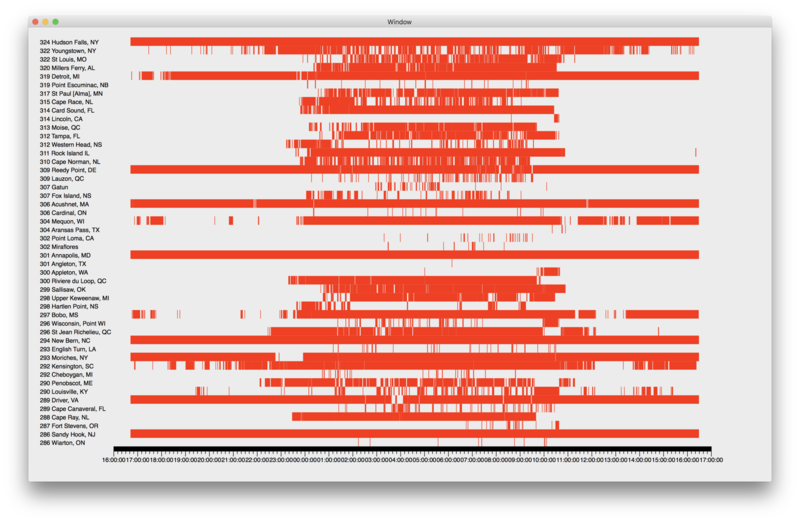 Previously you could just unload the driver when you wanted to run your SDR software, but Mac OS X 10.11 El Capitan compounds the problem by making that impossible under normal conditions. This is part of Apple’s System Integrity Protection (SIP), also known as “rootless” mode. SIP prevents any user, even those with system administrator (“root”) privileges, modifying a number of operating system directories and files. Unfortunately this also prevents you from stopping the use of Apple’s built in FTDI driver, which you must do in order to run applications that use FTDI’s D2XX library. In our case, to stop the use of Apple’s built in driver, we need to install a codeless kernel extension (kext). This extension claims priority over Apple’s built in driver, but doesn’t actually do anything, leaving the device available for the D2XX library to access it. It should also work under 10.9 Mavericks, making it unnecessary to unload the Apple kext each time you want to use your SDR. Before continuing, please note that you perform all these steps at your own risk. Guaranteed to blow up your Mac. blah blah blah. 2. As soon as you hear the startup chime, hold down Command-R and keep it held down until you see the Apple icon and a progress bar. 3. After you have booted into Recovery Mode, select Terminal from the Utilities menu. 5. You should see a message saying that SIP was disabled. 6. Select Restart from the Apple menu. For an SDR-IQ, you would use the file SDRIQUSBFTDICodelessKext.kext instead, as it has a different USB PID (Product ID). You can then run SdrDx or another SDR app that expects a networked SDR. I can’t provide individual assistance with getting this to work, but feel free to post questions as comments, and maybe I or someone else can provide an answer. Cocoa1090 is a Mode S (ADS-B) aircraft transponder decoder for Mac OS X, written for use with RTL-SDR devices (RTL based USB tuner dongles). These transmissions are at 1090 MHz, and can be received at a distance of a few hundred miles, often even with a modest antenna. Cocoa 1090 uses rtl_tcp, part of the free RTL-SDR package, to control the RTL device, and produce I/Q data.